Good Blackjack Rules or Penetration – Greater Impact on Card Counting? BlackjackClassroom > Blog > Good Blackjack Rules or Penetration? Greater Impact: Rules or Penetration? There are many conditions in blackjack that make a game more or less profitable for card counting. Two of the most important conditions are the blackjack rules of the table and what is referred to by card counters as the dealer penetration. When counting cards you’re looking for the best combination of the two in order to maximize the expected value of your play. Let’s start by defining what we mean when we talk about “good blackjack rules” and “good dealer penetration”. I will then go through a quick analysis of which condition is more important in maximizing your profit potential. As always, my main focus in blackjack is increasing profits. H17 or S17 – This refers to the dealer hitting or standing on Soft 17. We prefer the dealer to stand. DAS – This refers to a player’s ability to double after splitting. If you split your 8’s and get a 3 to make 11, you want to be able to double down on the 11. RSA – This refers to the player’s ability to resplit aces after an initial splitting of aces. If you split a pair of aces and get a third ace, you want to be able to split that into a third hand. LS – This refers to a player’s ability to surrender. Surrendering allows you to forfeit your hand and get half of your bet back without playing out the hand. This is commonly used when on a player’s 16 versus a dealer showing a 10. These are the main blackjack rule variations you will encounter, but it’s certainly not all of them. We’re going to assume you’re getting the full 3:2 payment on blackjack and you can double any two initial cards dealt. Preferred Rules: To get the best of these rules, you want the dealer standing on Soft 17 and you want to have the DAS, RSA and LS options available to you. “Dealer penetration” is blackjack terminology used for describing how deep a dealer will deal into a deck (or multiple decks) before reshuffling. This is a critical concept in card counting. Penetration is determined by where the dealer places the cut card and it varies from casino to casino. A deeply placed cut card will show you a higher percentage of the cards in a shoe, therefore giving you more information to work with when tracking the count. It also causes high counts to occur more frequently and last longer. For basic strategy players, penetration really doesn’t matter. For card counters, the deeper the penetration, the more profitable the game will be. Preferred Penetration: Typically a 6-deck game that deals 4 out of 6 decks is considered to have “poor penetration”. 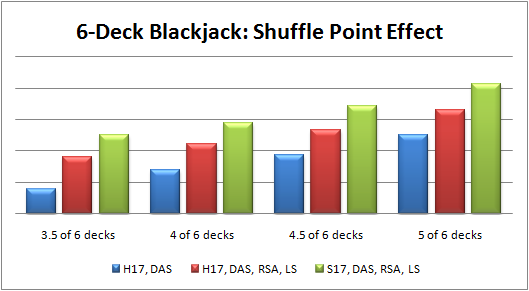 Dealing 4.5 decks out of 6 before shuffling would be “average penetration”. A casino that shows 5 full decks out of 6 before hitting the shuffle card has “good penetration”. Therefore if Casino A is dealing 4 out of 6 decks before shuffling and Casino B is dealing 5 out of 6 decks before shuffling, Casino B is going to be a much more profitable game for card counting assuming the rules of the tables are similar. Often the choice comes down to this… Do you go play at a casino that has all the best rules but poor penetration, or do you go for unfavorable rules with good penetration? Although you want the best of both, what if you have to decide between the two? Let’s take a closer look at the relative performance under different rules and penetration levels. Here we see the relative profitability of three different sets of rules at four different depths of penetration. For this example I’ve kept the parameters simple and consistent. I’m using a 6-deck game with a Hi-Lo card counting system, 70 hands played per hour, 4 players at the table and an optimal betting ramp from 1-10 units with no back counting or backing out of negative counts. Manipulating any of these parameters will obviously change the chart somewhat. This chart would also look different if we analyzed a single deck, double deck or 8-deck game instead of this 6-deck game. Conclusion: You can see that if you have terrible rules on a game, you better have good dealer penetration if you want to make money. If you have great rules you can be a little more forgiving when it comes to the shuffle point. Then there’s the middle ground of semi-decent rules and average penetration. The lesson to be learned here is that to be a successful card counter you really need to know how to analyze the quality of a game. There are also many other blackjack conditions to consider such as the level of casino heat you will get at different betting levels with different betting ramps. Hopefully I’ll get a chance to cover some of these other issues in a future post. For now I hope this helps to clarify the decision between good rules and good penetration. Now go hit the tables and make some money!